This weekend my family gathered to celebrate my Granddaddy's 99th birthday. 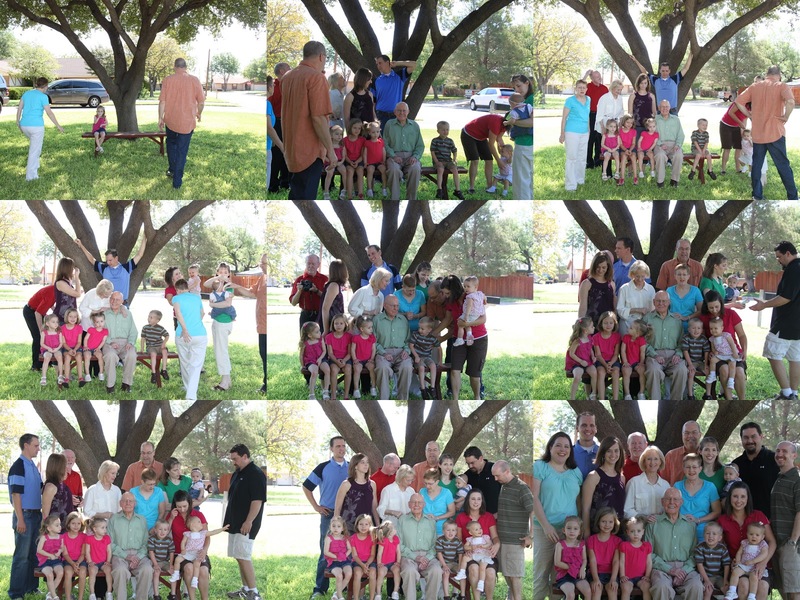 Decided that we needed to attempt family photos.....thankfully, my parents have a great oak tree in the front yard which provided ample shade for our photos. Three sets of 10 shots each yielded one pretty decent shot, with good expressions and smiles on everyone's faces and all the kids looking at the camera! Then we got Granddaddy with his 6 great-grandchildren: Emily, Lindsey, Reagan, Anna, Andrew and Amy. One of the hardest shots to get was actually of the grownups! Probably because we didn't take too many shots and just assumed that one would be good. All the grandkids with spouses. Back: Blake (Lianne), Heather (Phillip). Front: (Robert) Lauren, Granddaddy & me. Finally a family shot of just us with Granddaddy. Not quite all of us looking quite perfectly at the camera, but it is pretty good. After the posed shots in the yard, we headed into the house to 1) cool off 2) eat lunch and 3) have dessert and open presents! Granddaddy's favorite Lemon Chess Pie! Granddaddy, we love you and are so happy to still have you with us! Three weeks and 900+ photos later (culled down to 560), it is time to talk about our vacation.....we left the heat of Texas for the coolness of the Canadian Rockies. and a great playground onsite that Emily loved! We got in super late on Saturday night, so Sunday was a kinda lazy, settling day. We found a fun cafe for brunch, ventured over to the visitor's center, unpacked, rested and made a plan for the week. Monday morning we walked into town and saw this momma and her ducklings along the way. We spent the day exploring the town of Canmore. It is about 20-25 minutes east of Banff. Thankfully, miss Anna didn't mind riding in her stroller and Emily's 3 year old legs never got tired. Tuesday we headed up to Banff to explore. Emily enjoyed posing with her first moose. We saw very few animals - the best shot I could get was out the car window of this deer. After lunch we headed to Bow Falls. Before our dinner reservations, we had time to stop off at a playground. There were a few wet spots from the rain earlier, but the girls really enjoyed it! For dinner, we rode up into the forest on this wagon. Amber, our driver, was from Australia and it was so fun to hear her talk to the horses, Boone and Crockett. As we were leaving Banff to head back to Canmore, we saw this sign and discovered that a "Texas gate" is really just a cattle guard! Wednesday we drove back into Banff National Park and headed for Johnston Canyon, after a yummy brunch in Banff and exploration of the farmer's market. We stayed at the Johnston Canyon Resort in 1994 when our family last vacationed in western Canada. Heather and I have a photo in front of this bear from 17 years ago. The hike up to the lower falls of Johnston Canyon is only about 1/2 mile, but it isn't the easiest in the world. However, it is definitely worth the effort. As the bottom, Emily discovered this baby bear and decided she needed to climb on and pose! After we finished our hike, we headed up in search of some glaciers. It was cold and windy, but Bow Lake was gorgeous and we could see Bow Glacier off in the distance. The girls modeling their Stars outfits. Thursday, we planned another low-key day. We found breakfast at the farmer's market in Canmore. Several of the same vendors were there from Banff the day before. After breakfast and a bit of shopping, we found another playground in town for Emily to explore. She loved it! Anna even got in on the action again! After naps and while Phillip was cooking dinner for us, the girls headed back down to the playground at our condo. I think it was Anna's first time in the grass. She wasn't sure what do with it, but she didn't scream either. And she enjoyed being "caught" on the slide by big sister! Emily mastered this tall climbing wall very quickly. After a few instructions to use her feet not her knees, she was off and climbing! Friday, we drove up through Banff National Park to Jasper National Park because Phillip really wanted to see a glacier up close and personal. The closest option was the Athabasca glacier - one of the toes of the Columbia Icefield. We ate lunch at the visitor center (which didn't even exist the last time we were there) where the girls met another moose and a bear, and then headed over for the walk up. Starting our trek up to the glacier. It was a harder climb than we remembered. Phillip carried Emily up the whole way and the rest of us struggled. Then near the top we started being pelted with icy sleet coming off the glacier. It was actually pretty miserable. But, we conquered the climb and have photographic evidence. Sadly, it all had to come to an end. We left temperatures in the 60s/70s and returned to the 100s.